Chill chocolate edibles of the highest quality. They are 100% safe to consume. Chill, the company offers top chocolate edible experience. Chill, the company, works consistently to provide its consumers with safe and delicious products. Chill Chocolate bars are handmade from organically grown and ethically sourced ingredients. Sweetened with real peppermint and silky milk chocolate, this Chill bar is the perfect evening time experience. 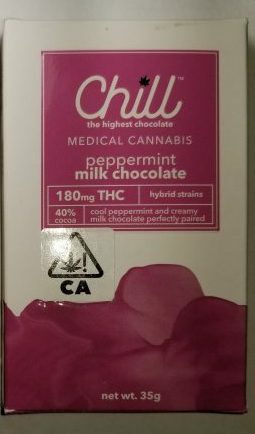 Each bar of Chill Peppermint Milk Chocolate contains 180mg, <2mg CBD. Each bar is divided into 10 segments, each segment containing 18mg of THC. This rich dark chocolate will have you wanting more. It is a premium dessert triple lab-tested and made with CO2 extracted THC. A bite from this gourmet will light your buds with the desire to have more. It is an ideal edible for evening time experience, or if taken as nightcap. ***This edible was produced in a facility that processes milk, wheat, peanuts, walnuts, almonds, and coconut. Wow!! What a tasty Chill Peppermint Milk Chocolate !!!!!! !